In brief: Here’s a quick roundup of Saturday’s race results. Full recap on Sunday night/Monday morning. 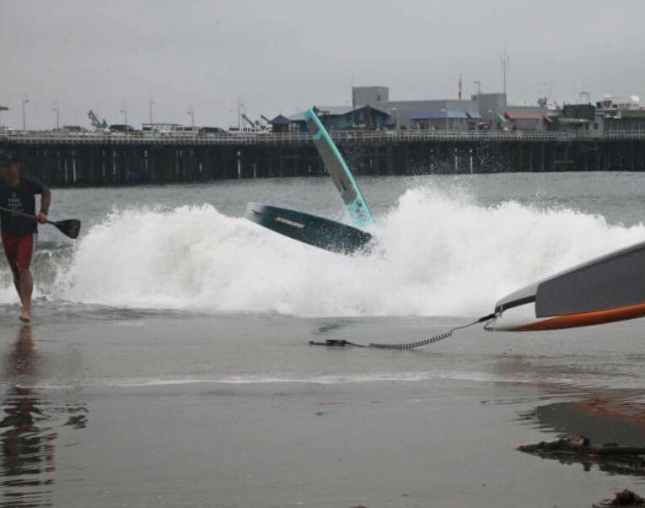 Mo Freitas has won the Santa Cruz Paddlefest, narrowly edging out Giorgio Gomez and Slater Trout after the front pack stuck together right til the final sprint up the beach. Noa Hopper, Poenaiki Raioha and Ryan Helm were near the pointy end of the field as well. Fiona Wylde took a similarly tight win ahead of Shae Foudy. The two were caught up in an entertaining shorey smash (pictured above). The SUP surfing side of the event continues this afternoon in solid conditions. Candice Appleby and Rob Rojas have taken out the Dana Ocean Challenge, the 29th annual edition of this SoCal stalwart race. Full results should be up on Paddle Guru shortly. Kelly Margetts, Angie Jackson and James Casey claimed wins on day one of the Saucy Jack Classic. Kelly won the BOP race ahead of Jake Jensen, Toby Cracknell, Trevor Tunnington, and James. James backed up his 5th in the BOP with a win in the unique head-to-head knockout sprints, triumphing over Kelly in the final. Angie made it a clean sweep, with Terrene Black and Karla Gilbert filling the podium. The event concludes Sunday with a 10k distance race. SUNDAY UPDATE: James Casey and Angie Jackson take out the distance race. The Ultimate Waterman wraps up in New Zealand this weekend, with Zane Schweitzer, Danny Ching and Connor Baxter among the elite ocean athletes taking part in this unique, multi-sport event. After 6 of 7 events, Zane Schweitzer sits atop the eight-man leaderboard, while Danny Ching is holding down second. The final event is a 20km SUP race. Hit the official Facebook page for regular updates. SUNDAY UPDATE: Connor defeats Danny and Zane in the distance race, however Zane takes the glory by claiming the overall champion’s title.